Torrential rains from Typhoon Kaemi have left over 80 people dead or missing in China, with a military barracks swept away, landslides wiping out thousands of homes and rivers bursting their banks. Six people were confirmed killed and another 38 soldiers and their relatives were missing after floods destroyed the military barracks in the eastern province of Jiangxi on Wednesday, the Xinhua news agency said. Chinese President Hu Jintao called for "prompt and all out efforts" to find those missing from the barracks, according to Xinhua. Jiangxi was one of the worst hit areas from Kaemi, which struck the mainland on Tuesday night before weakening into a tropical storm, with Xinhua reporting more than 9,000 homes had been destroyed by floods in the province. Aside from the military barracks disaster, at least nine other people had been killed in Jiangxi and around 20 more people were missing, an official with the provincial flood headquarters surnamed Qiu told AFP by phone. Xinhua said at least 18 people had been killed and 64 were missing across southern and eastern China due to Kaemi and its aftermath, with more devastation expected as the storm continued to hover over the region. 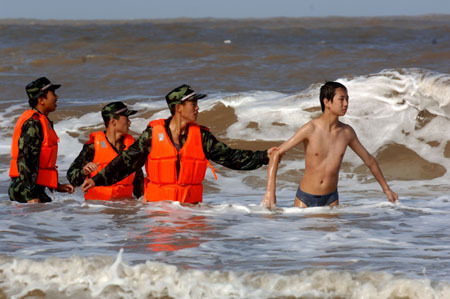 Four of those killed were victims of landslides in the southern provinces of Guangdong and Hainan. Television footage showed rivers in Jiangxi overflowing their banks and sweeping through valleys and lowlands. Government agencies throughout south and southeast China warned of reservoirs overflowing their banks and causing huge damage. More than 750,000 people had been evacuated from their homes early in the week as the region prepared for Kaemi. The region is still reeling from Tropical Storm Bilis, which hit southeastern China on July 14, resulting in nearly 10 days of torrential rains that took the lives of more than 600 people.